Encourage friends and family to support your station! There are more ways to support Solution FM than just through a financial gift. You can help tell everyone you know about this ministry and how much it means to you and your family. When you copy and paste the messages below, you'll be giving your Facebook friends and Twitter followers the opportunity to jump on board and financially support Solution FM. After you copy and paste, feel free to personalize it so your friends understand your passion for Solution FM. Not only can you donate your status, you can also donate your Facebook profile picture. If you don't really change your profile picture all that much, you'll find it's pretty simple. Instructions are included below. Thank you for supporting Solution FM in this unique way during our Pledge Drive. 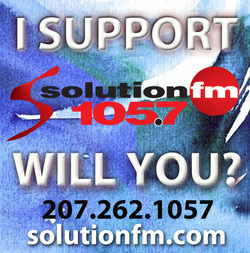 I support 105.7 Solution FM and so can you! They need your financial support to keep encouraging Maine and Canadian families. Call them at 207.262.1057 or visit www.solutionfm.com. I support @solutionfm and so can you! Call 207.262.1057 or visit www.solutionfm.com. Right-click the above image and click save image. Save to your desktop for easy retrieval. After you log on to Facebook, change your profile picture by moving your cursor over the upper right-hand corner of your current photo. Click "Change Picture" and upload the picture.